As you may have noticed, I kind of have a thing for breakfasts. They are just the easiest to make and at the same time most delicious. I once read a statement about breakfast that I really liked because I never thought of it that way but it is so true: You can never actually skip breakfast because the first time you eat during a day is when you “break your fast”. So having a long list of breakfast recipes and ideas is actually a must, right? And one other thing about breakfasts – you can make them look and taste like a real dessert but at the same time know they are oh so healthy. And that to me is a perfect combination. So the other they I’ve been thinking what I could make myself for breakfast since I’ve lately been on a kind of banana pancake breakfast “diet” (I just couldn’t get enough of them). 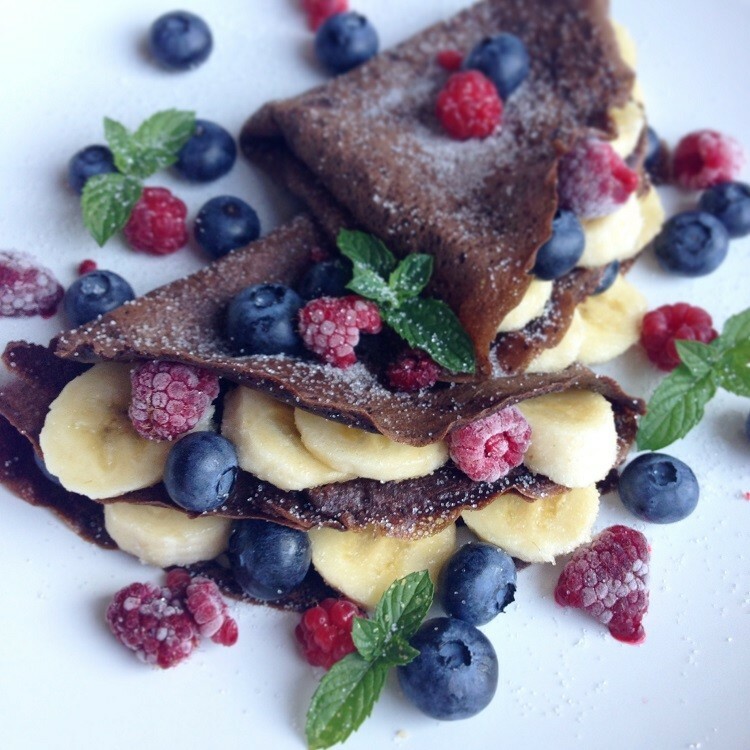 I decided to go with a variation on these same ingredients – two eggs, banana, some raw cacao and fresh fruits, but I “wrapped” them in a completely different dish – chocolate crepes. 1. In a small bowl or simply a bigger cup, whisk the eggs with a fork, then add the cacao, carob powder and Sukrin to taste. If you have trouble getting your cacao to mix with the eggs, help it a little by using a stick mixer. But don’t over mix because in this case your “batter” will be too thin to make crepes from it. 2. In the meantime, heat a pan to medium heat and add in some olive oil and/or butter. You really want your pan to be heated well so that the crepes will cook as soon as you place them in the pan. 3. Pour half of your chocolate mixture in the pan and distribute as you would with regular crepes. Cook for about a minute or two or until you see that the batter is starting to set on top as well. Flip the crepe (I found it easiest to lift a side of the crepe with a spatula but then actually flip the crepe with my hands), cook for additional minute and remove from pan. Repeat with remaining batter. 4. Serve with some fresh fruits and mint and sprinkle with Sukrin. You can also have them with some sugar free Nutella, homemade jam, almond butter or any other topping of your choice.